Canela is a well-traveled dog already but is about to make the trip of a life-time! 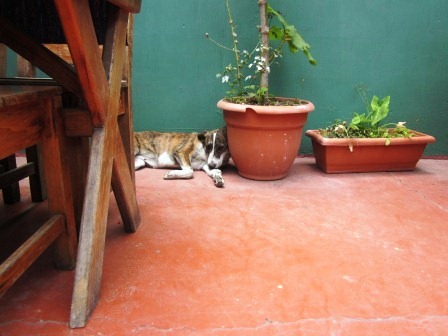 Canela joined the Ayuda family about 2 years ago when she showed up near the top of Calle Santander. After a bit of tracking it was determined that she was indeed homeless and needed the Ayuda Standard Care package. Being the adorable, friendly little scamp that she is, she developed a good support group quickly by befriending those who frequent businesses in the area like PanaSuper, La Parada, La Palapa and Cafe Q’Anil. Several locals have offered Canela a home but little lady just wouldn’t stay put! The drama began at the beginning of this year when she disappeared for well-over a month. It was believed that the worst had happened and that she was no longer with us. Then…. Three Ayuda volunteers were shopping in Quetzaltenango also known as Xela, when who runs up to them all smiley and waggy? Canela! No one knows how she ended up almost 3 hours away but there she was, no collar, no person, in the busy streets of a new city not a village. There was no way she was staying there so our friends hired a private van to transport Canela and themselves back to Panajachel. She stayed several days with Brooke and Annie but then it was time to take off to her normal haunts. For her next trip, a visitor to the Lake fell in love with her and took her over to a different village where they left her when they returned to their country. Ayuda was notified and prepared to go pick up Canela one more time; however, before we got there, she met Laura who happened to be staying at the hotel where Canela was left behind. Love sparks flew! 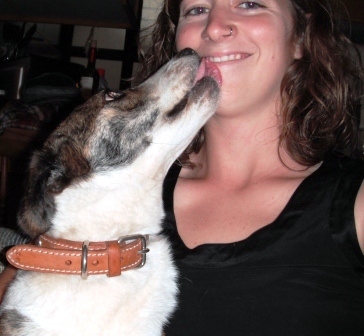 Laura and Canela are now in Antigua, GT where Canela is adjusting well to home life. The two will depart for the States later in the summer. We wish them both the very best of luck!